A prehistoric fish said to be the cause of King Henry I's death could once again flourish in the River Aire in Yorkshire. 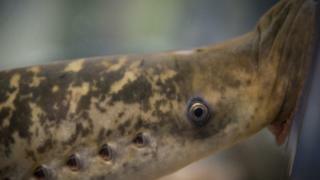 The DNAire project aims to improve biodiversity in the river by providing passes for river eels and lampreys. Pollution from factories and man-made barriers reduced numbers of lampreys and other species following the Industrial Revolution. Officials said the scheme would see the first "free migration" in 200 years. The plans have been submitted to Bradford Council. The £1.6m scheme, funded by the National Lottery, will see fish passes built on four weirs - including at Saltaire, the last major barrier between the North Sea and spawning grounds in Gargrave, North Yorkshire. According to the Local Democracy Reporting Service, the planning application says: "These weirs form an important part of the historic landscape of the Aire Valley, and the industry they supported played a key role in the heritage of the river but also in its ecological decline. "Through the construction of fish passes we will not only reconnect the ecology of the river but also tell the story of the river's past." A decision on the application is due in February.